This article describes how to configure OneLogin to provide SSO for ServiceNow Express using SAML. Search for ServiceNow Express and select it. Go to the Configuration tab and enter your ServiceNow Express Login URL in the format https://subdomain.service-now.com. Go to the Parameters tab to confirm the mapping of OneLogin values to ServiceNow Express attributes. 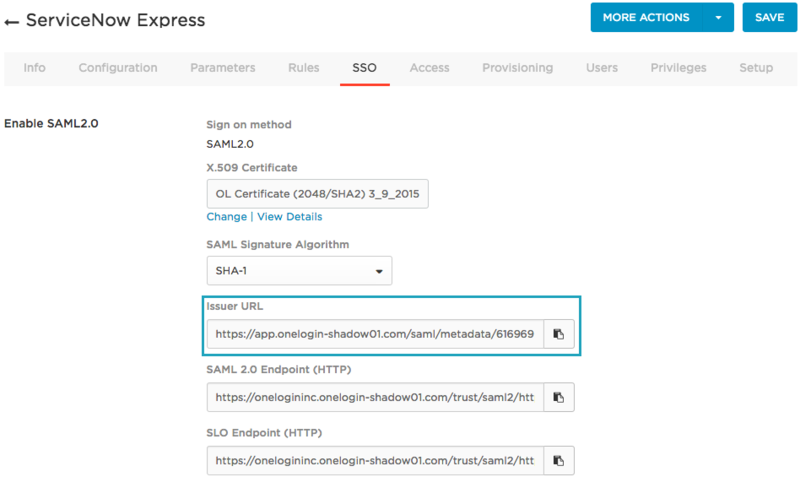 Username is included in the SAML assertion passed by OneLogin to ServiceNow Express. Typically, you can keep the default mapping to Email. Roles and Password are used for provisioning. On the SSO tab, copy the SAML Issuer URL; you will provide it to ServiceNow in the next step. If you want to change the certificate, click Change under X.509 Certificate and follow the prompts. In another browser tab or window, go to your ServiceNow Express account to configure OneLogin as an IdP. Go to User Administration > Authentication > Single Sign-on. Enter your OneLogin SAML Issuer URL in the IdP Metadata URL field, click Fetch, and then click OK. The Fetch process populates the IdP fields on the form. Review them by comparing them to the OneLogin fields on the SSO tab. Click the configuration icon on the upper right of the Single Sign-On page and enable the Enable multiple provider SSO configuration property. This enables the use of SSO and adds the link Use external login to the login page. Return to OneLogin and go to the Access tab to assign the OneLogin roles that should have access to ServiceNow Express and provide any app security policy that you want to apply to your ServiceNow Express users. Note. You may want to give access to yourself or a test account and test your completed OneLogin SAML integration with ServiceNow Express before you assign additional roles on this tab. See step 11, below. Ensure that you have a user account in both OneLogin and ServiceNow Express that uses the same email. Make sure that you are logged out of ServiceNow Express. Go to your ServiceNow Express login page before your OneLogin session ends. If the test user is granted access to ServiceNow Express without having to provide login credentials, then SAML works.